The front of the card displays your name, the Mastercard Brand Mark, an individual card account number, and an expiration date. The Amscot MoneyCard stores value of the dollar amount you choose to load and maintain on the card. As you use the card at merchants or ATM’s, the amount of the purchase or cash withdrawal is automatically deducted from the card’s available balance.  Reloading the Amscot MoneyCard is easy! *While this feature is available for free, certain other transaction fees and costs, terms and conditions are associated with the use of this Card. See the Cardholder Agreement for more details. **Standard message and data rates may apply. The Amscot MoneyCard Prepaid Mastercard is issued by MetaBank®, Member FDIC, pursuant to license by Mastercard International Incorporated. Mastercard is a registered trademark, and the circles design is a trademark of Mastercard International Incorporated.